"In the last six years the firm, which opened with just a few patients, has become East Africa's leading eye clinic and offers a wide range of services, from eye tests to laser surgery. 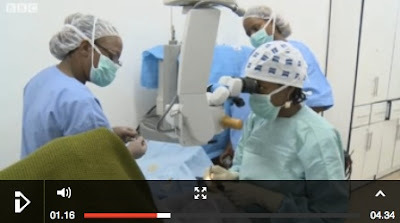 "Right from the onset our dream was to work in a centre that can be able to provide all types of eye care as a one-stop shop," one of the founders, Dr Kahaki Kimani, told the BBC's series African Dream. "We also wanted to be a centre of excellence and so, when we saw a lot of our people travelling [for treatment] long distances outside the country -- to Europe, to South Africa, to India -- we felt that probably it was the right time to bring some of these services closer home."